Malaysia has a new ‘star’ bartender, as the Heineken® Star Serve 2018 winner was crownedtoday at Blackbox, Publika. In a tightly-contested finale, eight of Malaysia’s finest bartenders went head-to-head to bag the title of the best Heineken® bartender in Malaysia, with Edilon C. Cauilanfrom The Beer Factory, Raja Udaemerging victorious. Heineken® Star Serve is a programme under HEINEKEN Malaysia’s Star Academy, aimed at training bartenders to deliver the perfectserve of Heineken®every time. This year’s winner has won an all-expense-paid trip to Amsterdam, the home of Heineken®, where hewill stand a chance to represent Malaysia at the Heineken® Global Bartender Final in October. Now in its fifth year,Heineken® Star Serve 2018 saw draught masters Jonathan Chong and Thomas Lingteaching the Heineken®5-step Pouring Ritual to more than 600 bartenders across eight cities in Malaysia. The top bartender from each city was then invited to Kuala Lumpur for the Heineken® Star Serve National Final. The Heineken® Star Servepouring ritual involves five steps: rinse, pour, skim, check and serve. These 5 steps are the secret to delivering the perfect serve of Heineken®. Mastery of the ritual, however, is not enough to guarantee the top spot. Personality and charisma form the Star Factor that plays an important role tostand out from the crowd. “The perfect Heineken® serve is an art in itself, and HEINEKEN® Malaysia Star Academytakes great pride in ensuring that our consumers get the full Heineken®quality and experience, from brewing to consumption. Through this training programme, we can ensure that fans ofHeineken® beer will receive the same high quality serve at world-class standard, no matter where they are”, said Andrew Woon, Sales Director of HEINEKEN® Malaysia. The Heineken® Star Serve 2018 winner will join 2017 winnerDaimler Kenn Cagas, in a face off during the pre-finals in Amsterdam. 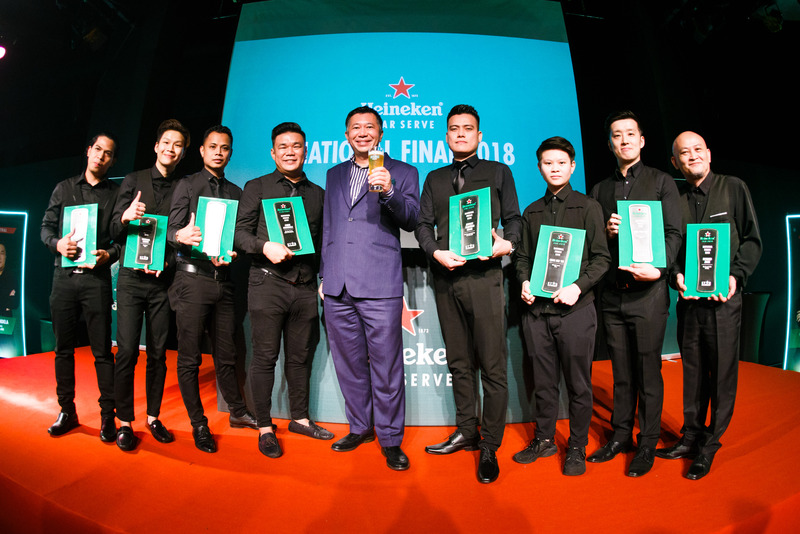 The winner will then represent Malaysia at theHeineken®Global Bartender 2018 finals the next day. They hope to emulate the success of Sabahan, Eddy Jay Jaimin, who was crowned the Heineken® Global Bartender of the year in 2016. HEINEKEN Malaysia’sStar Academy aims to provide a better drinking experience to fans of HEINEKEN Malaysia’s brews all across the country. This training provides knowledge and helps bartenders hone the art of perfect serve, delivering world-class beers and ciders at a world-class standard. For more information on Heineken®, log on to www.Heineken.com/my or follow Heineken® on Instagram@HeinekenMY or Facebook/HeinekenMYS. This entry was posted in News and tagged beer, heineken, star serve by TheGoodGoodGuy. Bookmark the permalink.